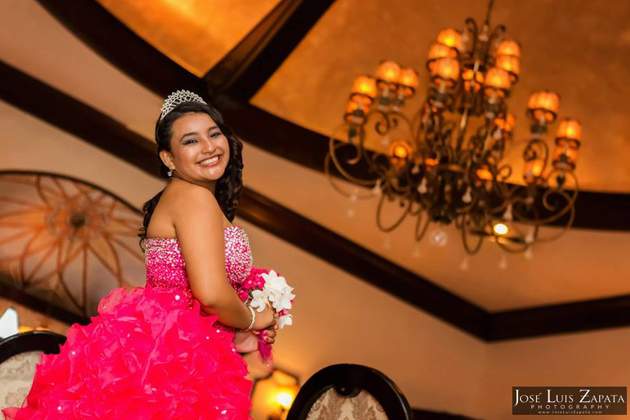 On Saturday, October 11, 2014, Dianita Cal celebrated her Quinceaños (15th Birthday) along with her friends and family in San Pedro, Ambergris Caye. She received her blessing at the Roman Catholic Church and a reception followed. Dianita Cal, daughter of Ana and Marc Cal, was officially presented to society by her Godparents Maria and Ismael Umaña. Other Godparents were: Giorgy Castillo, Dihno Norales, Edgar Najarro, Evelia Flores, Wendy Alvarenga, Letty Castro, Alba Najarro, Rebeca Cucul, Mauricio & Oneida Lara, Adan Najarro, Emily Cerpa, Maria Herrera, Amalia Cal and Calma Coc.